Should I Break Up a Chapter in My Book? 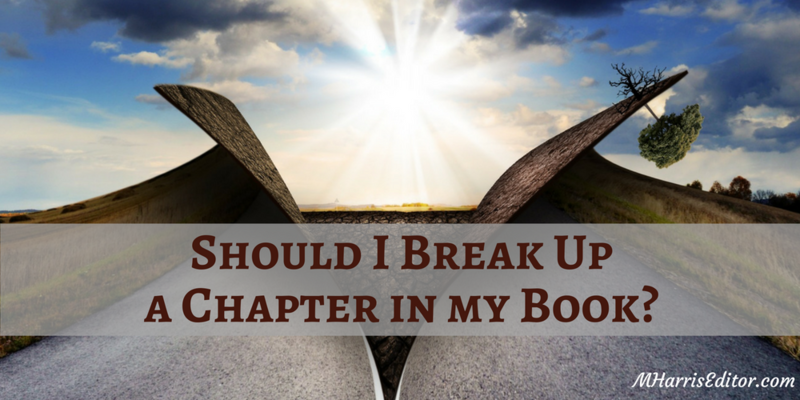 Home » Editor Blog » Should I Break Up a Chapter in My Book? A common problem writers may come across during manuscript editing is finding a chapter that is longer than the others. When this happens, you may ask yourself, “Should I break up a chapter in my book for consistency with the others?” After all, the chapter may stand out compared to the others; won’t readers notice the page difference? 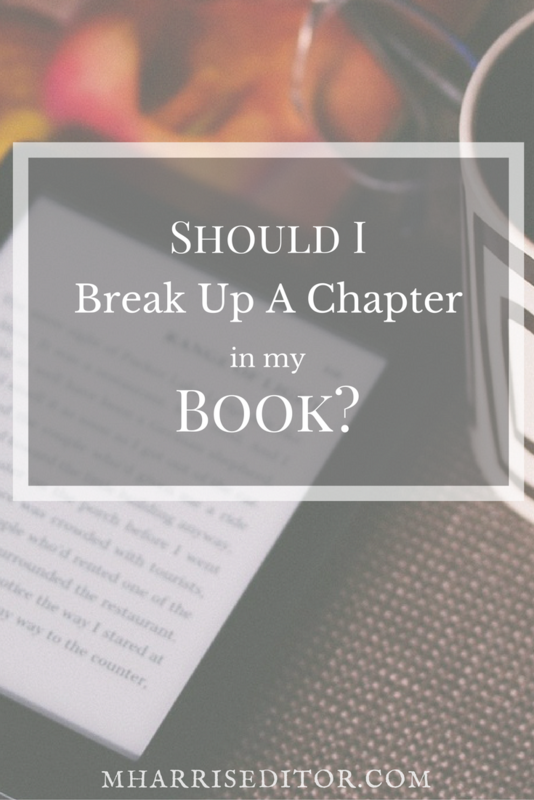 While the ultimate decision whether or not to break up a chapter in your book ultimately lies in your hands, the following tips may help you determine the pros and cons of making a large scale change to your book such as breaking up a large chapter. Consistency with Other Chapters – As addressed before, some writers choose to break up a particularly long chapter into two or more parts to keep the length consistent with other chapters. For example, if your chapters are between 7 and 10 pages, suddenly having a chapter double the length may feel troublesome. Discussing the issue with an editor and readers whose opinions you trust can help you determine if this is problematic. Leaving Readers Wanting More – A writer’s ultimate goal is to gain a loyal readership, and if in your review you do not feel the chapter is filling the need or drags out the story, it may be time to split it into more than one chapter or make significant changes until you are satisfied. Finding a good place to naturally break up the chapter can help the story flow better, which keeps readers turning the pages long after they have decided to finish reading for the day. Unnatural Pause in Story – Many readers may not notice, but the structure and formatting of books frequently determines their experience. If a book has a chapter break and it feels inconvenient to the reader, it may be better to stick with the longer chapter. Unfinished Business – If you split your chapter up, does it feel incomplete or as if there are questions left unanswered? This could be a sign to keep the chapter together, but may also indicate a larger problem something like a content review could address. Still struggling to determine if you should split a chapter into two? Try these tips to find a natural point where the chapter could split. Scene Change – Are your characters moving from one place to the next? Do you have two or more running story lines where characters are encountering different sets of circumstances? Either of these scenarios can make a good place to turn one chapter into two. Character Action Change – Did your main character go to sleep in one paragraph and wake up later in the next? Did they hop in the shower, eat a meal, or make some other transitional action? Depending on your setup, a character action could make for a good place to split a chapter up. Tone Change – Has something surprising, startling, or depressing happened to your characters? In genres like horror or suspense, ending a chapter on a cliffhanger is common and makes for easy chapter changes. However, in genres like young adult or romance, relying on emotions like surprise, sadness, or contentment can help end a chapter. Context is important when determining if a tone change within a chapter offers an opportunity to break it up into two or more chapters. Remember, some of the most successful writers have had chapters long and small, and some write with no chapters at all. Only you can decide what is best for your writing and makes you feel comfortable upon publishing. The fact that your chapter review includes questions about what is best shows you are putting your best product forward, giving readers a high quality book they can enjoy and reread many times. St. Louis editor Megan Harris has had experience working with many authors on their books. If you are having trouble with your manuscript prior to publishing or want a second eye, please contact Megan to discuss your project today.